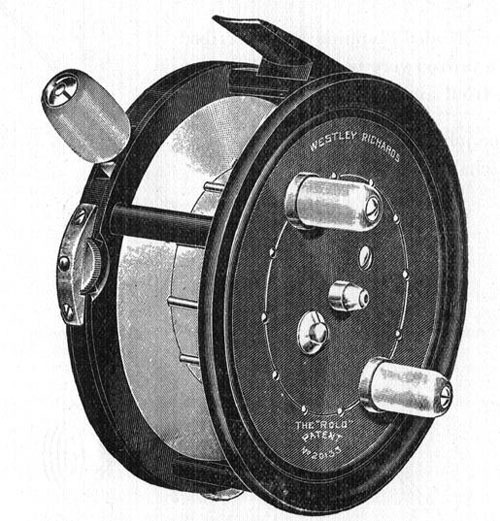 Walter Dingley is generally accepted as the inventor of the Hardy Silex reel. Having moved from David Slater’s factory in Newark sometime during the later half of 1893 he quickly established himself as a master reel maker. Westley Richards Rolo Reel made by Walter Dingley. The Silex was launched in 1896 under patent number 28,413. This patent would expire sixteen years later and there is no doubt that Hardy’s would have been thinking about improvements in the reel from the time of its launch. By 1909 Hardy’s had been granted patent 2206 for the improvement in the mechanism of the Silex reel. In 1911 Hardy’s announced their new reel the Silex No. 2. In September Walter Dingley is granted patent 20,133 for his brake mechanism. The internal mechanism of Walter Dingley’s patent reel. In October 1911 Walter Dingley sold his shares in Hardy Brothers and moved to join the company of J.J.S. Walker. So what happened? the short answer is we do not know and we can only guess. Walter Dingley came up with an improvement for the Silex reel and wanted paying for it. 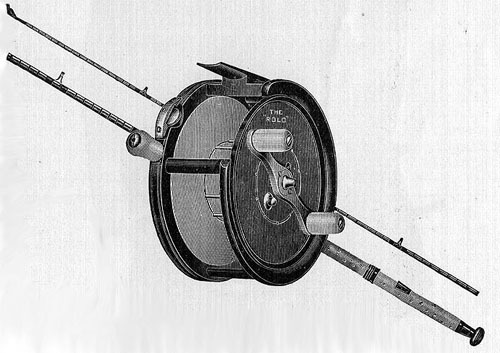 Hardy’s refused, used the 1909 patent for the improved reel and Dingley left. 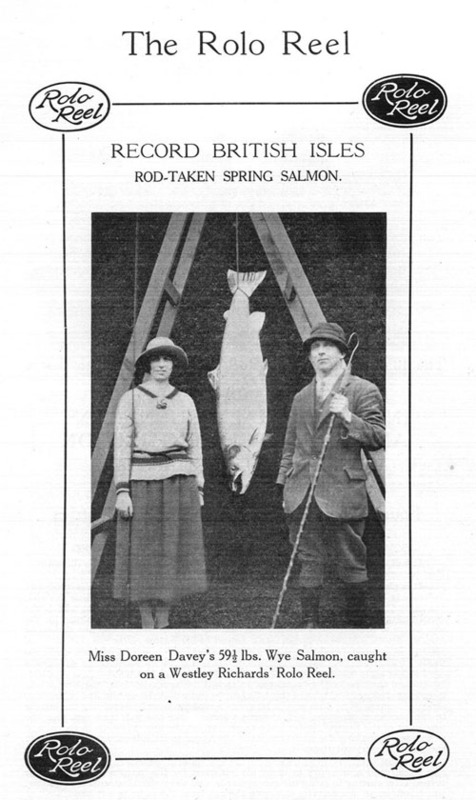 The angling press for 1912 carried many adverts for the two reels with Westley Richards offering the Silex copy under the name of The Premier and Hardy’s telling anglers to beware of imitations. Hardy’s called the Silex “obsolete” and “discarded by us but introduced by shopkeepers under other names”. Note the use of the word shopkeepers not reel makers. 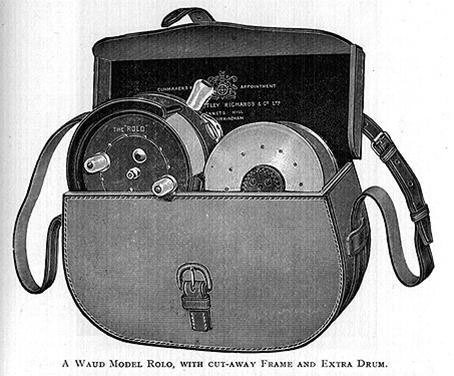 Walter Dingley quickly applied his new patent into a reel that would be taken up by Westley Richards as the Rolo. The reel was made in Walter Dingley’s factory The Climax Reel Company and also sold by other “shopkeeper” as the Climax reel. Even in 1926 three years after Hardy’s had launched the Silex Major they were still warning people about a reel that they had discarded many years before. Internal mechanism of the Rolo reel. 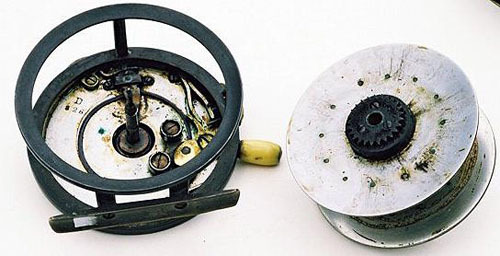 Internal mechanism of the reel showing the two rollers and the brake drum on which they act. Why did Hardy’s spend so much time and money trying to rubbish Dingley’s Rolo reel. First I think it was personal between Dingley and the Hardy’s. John Drewitt’s book is titled Hardy Brothers The Masters, The Men and Their Reels. Men should not become Masters as Dingley had done. Secondly, well Westley Richards were a major competitor. These days we tend to think of Farlow as the major competition to Hardy’s but for a time between the two wars Westley Richards were the big competition. They also had royal patronage as they were gun makers to His Majesty King George V as well as other royals. However it was Miss Doreen Davey’s 59½ lb. Salmon caught on the river Wye, using a Rolo that must have rankled with Hardy’s. This fish was a British record spring fish and another record fish caught by a woman. British Record Fish caught by Doreen Davey. The great thing about Dingleys reel was that the brake had a very fine setting due to the two rollers employed. 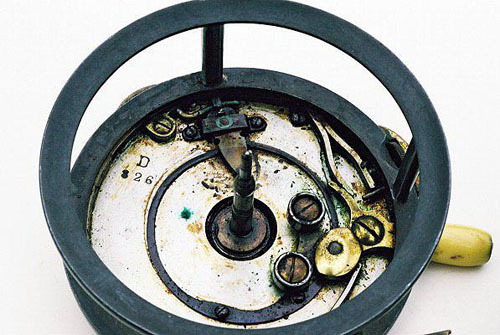 About a yard of line would be let out of the top ring and the regulating screw adjusted until the weight of the bait was sufficient to slowly turn the drum. It was available in five sizes from 3½ to 4½ inches with various sizes being favoured on various rivers. 4 Inch was the preferred size for the river Eden and 4½ inch for salmon fishing on the Wye. Suitable for Pike and Mahseer it was a widely accepted and used reel. George Waud a well known Yorkshire fisherman introduced a modification to the Rolo that soon become the widely accepted form of the reel. He had a quarter section of the frame removed so that he could also use thumb or finger pressure to control the reel. In addition to this he also devised a method of practise for the budding angler. The angler set out marks based on the clock face and if he followed the recommended methods he would soon become proficient in handling the reel either casting to his front side or rear. I once thought I had bought a Waud model Rolo when I saw one on a dealers list. It was offered in a leather case along with a spare spool. When I explained to the dealer how pleased I was and how rare it was and at £120 a real bargain he seemed please for me. Half an hour later he rang me back and said that he could not find it and he must have sold it. That was about ten years ago and I have never seen another since. I will be doing a follow up article next year on the company of Westley Richards. This entry was posted in Walter Dingley, Westley Richards and tagged Walter Dingleys Rolo reel. Bookmark the permalink. How rare is it to find a Hardy silex stamped D for Dingley? I have been looking for some years and not come across a single reel. I have seen many Silex reels with Dingleys big D inside them. Keep looking and you should find one with a bit of luck. I bought a unused spitfire finish silent check version with the “D” stamped inside. It is a masterpiece of reelmaking. I am always looking for more history on Walter Dingley. I have nearly every version and enjoy using one on occassion. proportioned pillars, impeccable precision,and marked with various shop names on the back. Wondered if there’s any news of Westley Richards article mentioned above.Would love to find out more but info on net is pretty thin. I will try and post something within the next two weeks. I have a few items to post but it just needs them converted to the web.